We recently obtained this 20' Lapstrake Grew Cruiser with a 170 hp Volvo 6 cylinder engine i/o. I have no idea why it was called a cruiser but that's what it says on the side of the boat. It has been sitting in a cottage garage for the last 15 years. 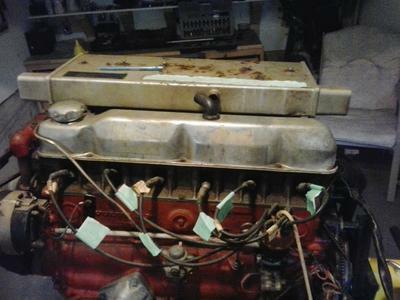 The previous owner had apparently started restoring it by removing the interior and the engine. The engine looks like it may have been apart and rebuilt but we are unsure. He then lost interest and the hull, engine and interior spent the rest of the time sitting in different parts of the garage. The present owner also had no interest in it and when he recently sold the cottage he was looking for someone who would restore it rather than having it go to the landfill. So we were able to obtain it for free. The hull appears to be in great condition other than the small hole I put in it while transporting it but lets not talk about that. All the hardware including the original horn and assorted fittings appear to be with the boat. The hull appears to have been painted at one time so I have no idea what is underneath. The gunwales are vinyl and if you imagine it someone has put what appears to be adhesive shelf paper on the bow. The engine is as I mentioned a volvo 170 hp straight six. It turns over well but has little compression. I believe that possibly the rings are seized so I have put kerosene in the cylinders and will turn over the engine by hand over the next several days and see if this will free up the rings. I have heard of people using diesel or automatic transmission fluid. I used the kerosene just because it was readily available and after all it is just refined diesel. Just have to remember to drain the crankcase and add new oil before checking the compression again. I figured this was possibly a quick fix before tearing down the motor. Especially if it has been rebuilt. The problem we are having right from the start is that the Grew Boat company ceased operation quite a few years ago and we have not been able to find pictures of this boat in its original condition. All the interior is in the boat but just piled up here and there and not an idea how it goes back together. And it looks like the original finishes have been changed over the years. There are boats of similar style which I suppose we could use as reference but it would be nice to have it as original as possible. If anyone has pictures of this boat I would really appreciate seeing them. 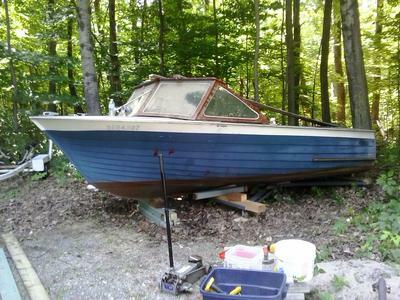 This is our first wooden boat restoration so any ideas or advice will be greatly appreciated. You did the right thing to add diesel to the cylinders. Volvo parts should be readily available. Once the hull is solid, get back to the engine.